William Cavendish and Joseph Paxton are familiar names to many orchid enthusiasts because of their prominent place in early orchid history. William Cavendish is better known as the sixth Duke of Devonshire, owner of the largest private collection of species orchids in the world by the mid-nineteenth century. Joseph Paxton was his head gardener, and it is to him that we owe most for the development of our orchid hobby, because he provided the expertise, while the Duke merely provided the money needed to acquire and house the orchids, and for Paxton to learn how to grow them to perfection! Although many gardeners were needed to maintain the Duke’s estate and gardens at Chatsworth (Derbyshire), the name of only one member of Paxton’s team of gardeners, John Gibson, is recorded in modern accounts of orchid culture. In 1835 Paxton and the Duke were building an enormous glasshouse at Chatsworth, destined to be the largest in the world, called the Great Conservatory. 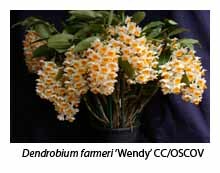 Until then they had purchased most of their orchids from nurserymen, particularly Loddiges’ nursery in Hackney (London). However, realising the large number of plants that would be needed to fill the Great Conservatory, they decided to send John Gibson, a 20-year old under-gardener, to India to collect orchids and other plants directly. Gibson left for India in March 1836, bound for Calcutta, where he sought advice on where best to look for orchids from Dr. Wallich, director of the Calcutta Botanic Gardens. Following this advice, Gibson set out for the Khasi Hills, some 300 miles inland. At that time there were no established roads, and Gibson was obliged to travel by small boat up the flooded Brahmaputra River. It was necessary to travel during the monsoon season to ensure that there would be sufficient water in the river’s tributaries to reach the Khasi foothills. Then followed a 4000-foot climb to his base, a Government bungalow at Cherrapunji, where he spent about five months collecting orchids and other plants. Gibson was overjoyed with the profusion of plants, although not impressed with the pouring rain in what was said to be the wettest place on earth! 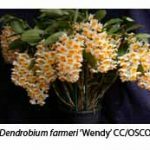 He was delighted to find fifty different orchid species in his first fortnight, although this was only a tenth of the number now known to grow in the Khasi Hills. Among the better known were Dendrobium devonianum, D. formosum, D. farmeri, Phaius tankervilliae, Thunia alba, Papilionanthe teres and Pleione praecox. After an absence of seven months, Gibson arrived safely back in Calcutta in February 1837. Shortly afterwards he was able to send 30 cases of plants to Chatsworth. When he sailed for England himself a few weeks later he was accompanied by twelve Wardian cases safely stored on the poop deck. His cabin was packed with baskets filled with orchids and other plants, while many more, still attached to their host branches, hung from the ceiling. Altogether he had found 300 new plant species, 80 of them orchids. Gibson’s efforts had made the orchid collection at the Duke’s estate the largest and most valuable in Europe. Gibson subsequently made several other trips to Southeast Asia in search of plants but these were much less widely publicised. He later became the superintendent of several minor London parks, before being promoted to superintend the prestigious James Park, Hyde Park and Kensington Gardens. However, he remains best known for the orchids he collected in the Khasi Hills for Paxton and the Duke of Devonshire. Gibson’s success prompted Paxton and the Duke to send two other young gardeners in search of plants and trees. Sadly both were drowned when their boat capsized in the Columbia River (western USA), and the Duke then refused to sponsor further collecting expeditions abroad.